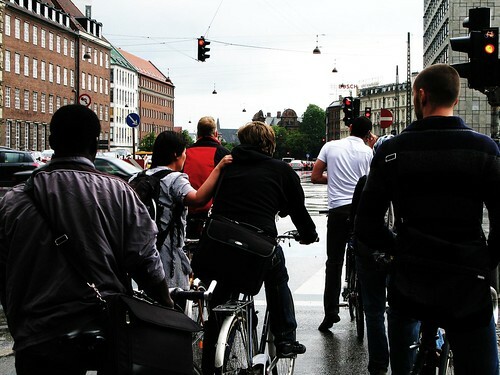 Copenhagners support each other in relationships, just like everywhere else. We just get to do it on bikes sometimes. 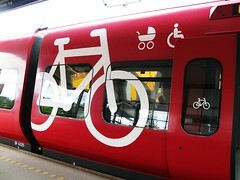 On Danish regional and intercity trains there are compartments for bikes, prams and wheelchairs. You can sit down if you like, but if one of the three vehicles come on board, you move to accomodate them. And, in order to help your bike stay upright, we have these lovely little seatbelty things to assist you and your bike. 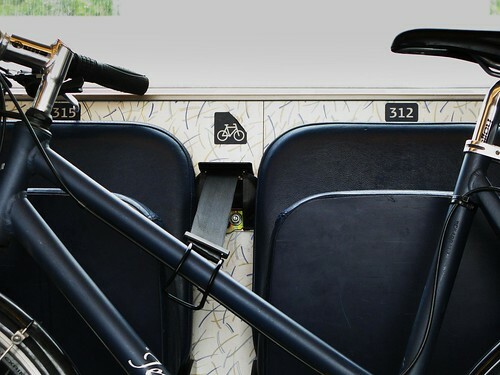 Oh, and in case you're in doubt, this is one of the bike compartments on the local trains. The Central Station in Malmö, Sweden [35 minutes by train from Copenhagen] is undergoing renovations, including building a bike parking garage. 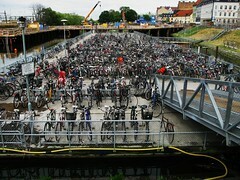 Until then, this Bicycle Island floats in the canal next door to the station to accomodate the thousands of bikes. 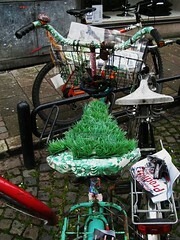 Another customised cargo bike on the streets of Copenhagen. This one sells fresh fruit cups by the harbour. 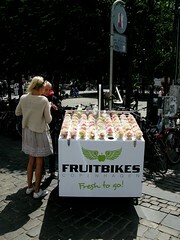 Fruitbikes.dk. What a splendid ride. Complete with plastic grass. Our mate Alo in Estonia sent this photo in - thanks_! It it a converted milk carrier from just after the Second World War. Used by the farmer to transport his milk to the collecting point, during the frightfully hard times in the Soviet era. As Alo puts it, the bike helped one family survive the hard years. In a modern perspective... am I the only one thinking 'beer keg'?